Hilton Head Magazines: CH2/CB2: Can You Benefit from this Growing Trend? With mortgage interest rates at or near historic lows, you may be wondering if it’s time to refinance your home. But declining property values and stricter mortgage lending standards may make it harder for you to capitalize on low mortgage rates, because you may no longer have enough equity in your home to qualify for a new mortgage. Enter cash-in refinancing. With cash-in refinancing, you bring cash to closing to reduce your mortgage balance and increase your home equity, enabling you to meet the lender’s loan requirements. WHY IS CASH-IN REFINANCING BECOMING POPULAR? Cash-in refinancing reverses the trend of cash-out refinancing that has been popular during the last decade. 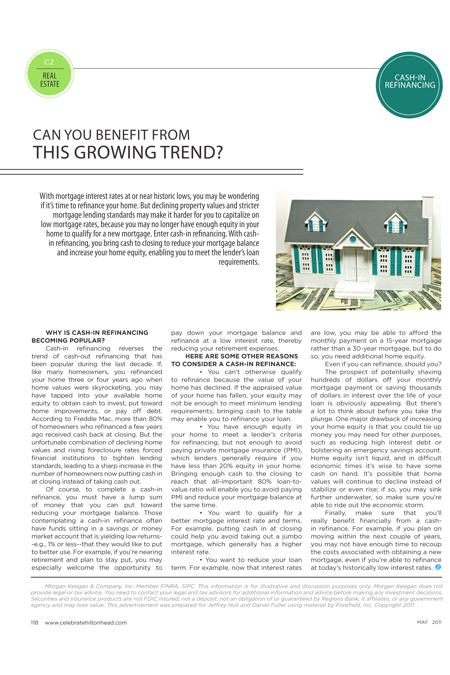 If, like many homeowners, you refinanced your home three or four years ago when home values were skyrocketing, you may have tapped into your available home equity to obtain cash to invest, put toward home improvements, or pay off debt. According to Freddie Mac, more than 80% of homeowners who refinanced a few years ago received cash back at closing. But the unfortunate combination of declining home values and rising foreclosure rates forced financial institutions to tighten lending standards, leading to a sharp increase in the number of homeowners now putting cash in at closing instead of taking cash out. Of course, to complete a cash-in refinance, you must have a lump sum of money that you can put toward reducing your mortgage balance. Those contemplating a cash-in refinance often have funds sitting in a savings or money market account that is yielding low returns—e.g., 1% or less—that they would like to put to better use. For example, if you’re nearing retirement and plan to stay put, you may especially welcome the opportunity to pay down your mortgage balance and refinance at a low interest rate, thereby reducing your retirement expenses. HERE ARE SOME OTHER REASONS TO CONSIDER A CASH-IN REFINANCE: • You can’t otherwise qualify to refinance because the value of your home has declined. If the appraised value of your home has fallen, your equity may not be enough to meet minimum lending requirements; bringing cash to the table may enable you to refinance your loan. • You have enough equity in your home to meet a lender’s criteria for refinancing, but not enough to avoid paying private mortgage insurance (PMI), which lenders generally require if you have less than 20% equity in your home. Bringing enough cash to the closing to reach that all-important 80% loan-to-value ratio will enable you to avoid paying PMI and reduce your mortgage balance at the same time. • You want to qualify for a better mortgage interest rate and terms. For example, putting cash in at closing could help you avoid taking out a jumbo mortgage, which generally has a higher interest rate. • You want to reduce your loan term. For example, now that interest rates are low, you may be able to afford the monthly payment on a 15-year mortgage rather than a 30-year mortgage, but to do so, you need additional home equity. Even if you can refinance, should you? The prospect of potentially shaving hundreds of dollars off your monthly mortgage payment or saving thousands of dollars in interest over the life of your loan is obviously appealing. But there’s a lot to think about before you take the plunge. One major drawback of increasing your home equity is that you could tie up money you may need for other purposes, such as reducing high interest debt or bolstering an emergency savings account. Home equity isn’t liquid, and in difficult economic times it’s wise to have some cash on hand. It’s possible that home values will continue to decline instead of stabilize or even rise; if so, you may sink further underwater, so make sure you’re able to ride out the economic storm. Finally, make sure that you’ll really benefit financially from a cash-in refinance. For example, if you plan on moving within the next couple of years, you may not have enough time to recoup the costs associated with obtaining a new mortgage, even if you’re able to refinance at today’s historically low interest rates. Morgan Keegan & Company, Inc. Member FINRA, SIPC. This information is for illustrative and discussion purposes only. Morgan Keegan does not provide legal or tax advice. You need to contact your legal and tax advisors for additional information and advice before making any investment decisions. Securities and insurance products are not FDIC insured, not a deposit, not an obligation of or guaranteed by Regions Bank, it affiliates, or any government agency and may lose value. This advertisement was prepared for Jeffrey Hull and Daniel Fuller using material by Forefield, Inc. Copyright 2011.